Here is a before and after case study prepared by Susanne Slizynski, Managing Partner at Green Curve. This article and all contents are copy righted by © Green Curve Studio, inc. These plans were provided to us to evaluate, the doctor did not feel confident in the layouts and wanted our input. It’s critical to obtain a floor plan evaluation prior to start of working plans for permitting and construction. Once working plans start you will be charged for any modifications to the layout and layered plans as needed. Critical errors in the plan will leave you with tens of thousands of dollars in change orders and significantly delay the project. This article is copy righted by © Green Curve Studio, inc. This plan was prepared for the doctor by local design/drafting resources. Here is my review of the plan. 1 Entrance – The entry shown at the doctor’s office is actually the main front entry into the suite. It’s the only building entrance patients can use, in this plan patients will have to enter the space through the doctor’s office. In other words the doctor’s office is located where the Front Desk/Reception should be, they haven’t read the building shell plan correctly. 2 Exam/Consult/X-ray/Imaging – These functions are shown grouped together, they need to be in separate locations so that back to back consults and mid case records can be performed continuously throughout the day. In this case the NPE room layout is not functional. 3 Lab – Model Boxes should not be placed in the Lab as they will become very dusty. The lab is too far away from the clinic, staff will need crisscross patients coming and going to the Treatment Bay. 4 Staff Lounge – It’s best not to locate the Staff Washroom in the Staff Lounge. The Staff Washroom does not meet ADA code and will not pass inspection, the doctor will incur expensive tear out and revisions during construction, along with delays. The plan shows 2 stools at the sink counter, the stools scale off at 12” diameter, standard seating is a minimal of 18”, it’s hard to imagine a staff members sitting so close to a sink. Also prime window space is dedicated to staff lounge, but the Tbay is up against a wall that has no windows. 5 Front Desk – The L-shaped Front Desk only allows for 1 staff member to check patients in and out. A file cabinet is placed against a window, charts will be seen by patients checking in and there’s no private business of finance office. 6 Reception – There is no entrance into the suite from the Reception area and this is actually the back side of the building. The doctor’s office is actually the where the main entrance is located, where the patients park their cars and enter the building. 7 Patient Washroom/Mechanical Room – It’s not ideal to have washroom plumbing and a mechanical room flanking a NPE room because of the sound of flushing and the noise of the vacuum and compressor. 9 Sterile – The planner is showing a sterilization unit which is designed for a dental office and should not be specified for an orthodontic office which requires a different work flow. 1 Entrance – In the second draft the equipment supplier shows the front desk/reception at the building entrance. Then entrance door is too close to the front desk and the reception area it does not allow for patients and parents entering and existing the spaces to stack back at the front desk. Again it’s a one person work station which is fine for a dental office but not for an orthodontic office. 3 Washroom / Mech Room – There is no set back in the building, this wall goes straight across, so this layout won’t work as shown. 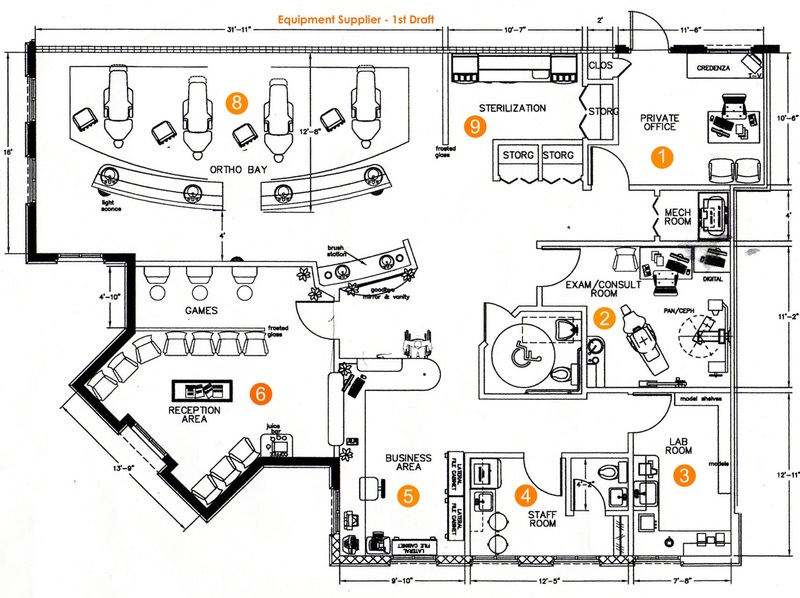 4 Lab/Mechanical – The lab is too far from the Treatment Bay and too close to receptions and the NPE room. 5 Staff Room – As far as flow it would be better to flip the staff lounge with the lab. The staff lounge does not allow for an 8 chair table, a must have on the client’s wish list. 6 Treatment Bay – Placing these treatment chairs disconnects them with the rest of the bay, and makes it hard to supervise due to lack of visibility. In draft 2 there are no sinks or rear casework for supplies at either Tbay, this is a detrimental omission. 7 Treatment Bay – There is not enough ergonomic detail here, imagine an assistants stool at the head of each tx chair with patients coming and going from this area, add the doctor and it’s a congestion zone, that will make your practice look disorganized. 8 Tooth Brushing/Sterile – the location of the tooth brushing station creates a blind spot, awkward flow, staff and patients entering the 2 chair bay will have to squeeze by patients brushing their teeth or navigate through the sterile area. It’s an anti-flow layout. 9 Sterile – The planner is showing a sterilization unit which is designed for a dental office and should not be specified for an orthodontic office which requires a different work flow. The sterile center is exposed to patient and parent view, as though it’s being showcased, given how busy an ortho sterile center is, this is never a good idea. 1 Entrance – The main entrance to the clinic in properly located and the front desk is visible from the entry door, this is ideal. A second entrance off the TBay area serves as a private doctor/staff entrance and meets the fire code requirements. 2 Front Desk – There are now 2 work stations at the front desk and the business office is screened off by a logo wall which became a water feature. 3 Business Office – The equipment counter in now screened off and a parent chair has been added for a brief financial consultation. 4 Records – A separate records room is located close to the exam/consult/X-ray areas. This will allow for smooth work flow. 5 X-ray – X-ray is now separated from the Exam/Consult so that X-rays can be taken without impeding into another work area. 6 Staff Lounge – Now accommodates 8 staff members, will allow for “lunch and learn” meetings and is located away from the busy front desk area. 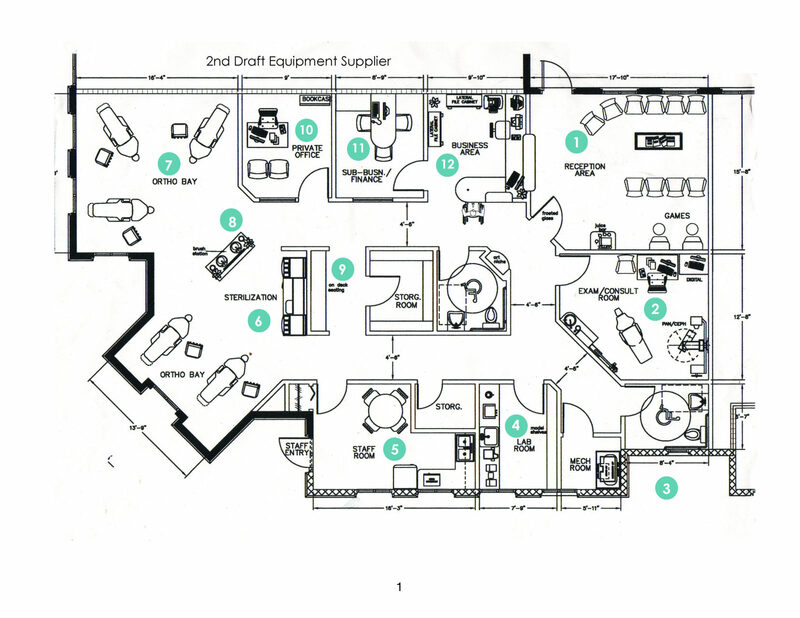 7 Exam Consult – This layout, allows more than 1 parent to be seated in the room, the doctor has access from the Treatment Bay so she doesn’t need to navigate around the parents. 8 Staff and Patient Washroom – Layout meets ADA code requirements, will pass inspection, and the Staff Washroom has been moved out of the staff lounge. 9 Sterilization – Is conveniently located central to the Treatment Bay and the cabinet layout is customized to accommodate sterilization work flow for an orthodontic practice. 10 Treatment Bay – A 5 chair Treatment Bay is located to take advantage of the window walls, the layout is now ergonomically correct for this practice, side chairs have been added to allow for overflow from the Reception room and an On-Deck Bench is also provided. When was your team hired to begin work on the project? Our team was hired 6 weeks after the lease had been signed, there is typically a 4-6 month window allowed for the project to be designed and constructed, then you will be required to pay rent whether the space is occupied or not. During this time the project will need to be fully designed, engineered (MEP), permitted, bid and constructed, 6 weeks have already passed. Is it true that the Equipment Supplier draft 1 does not have entrance into the reception area? Yes, we did not alter the plan in any way. The front entrance is actually where the main building entrance is located. Also there is only one entrance exit on their plans, which does not comply with national, state or regional fire codes, 2 points of entry for spaces more than 1,500 sf, some cities will allow up to 1,700 sf. 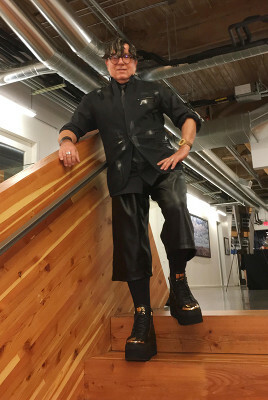 Was the space hard to work with? It wasn’t hard for our team to work with due to our extensive experience, but the projections, setbacks and funky angles pinched the flow. A more rectangular space without these features would have improved the flow and made for a more optimal layout. We are still not happy with the doctor’s office location, but this was a tradeoff for a larger staff room. There is very limited storage in this layout, while there is bulk storage just outside the space we prefer it be bel located in the suite. Overall you should try to avoid spaces that are too irregular, I have to laugh because we just finished an office that was shaped like a “barbell”, that was very tough! The seating at Reception is limited, why is that? We didn’t get our way on the layout, it was decided by a practice management consultant that to have a separate Latte Nook, a separated Internet Nook and a separate refreshments bar. Without this interference we could have added 6-8 more reception chairs, so it’s likely this will lead to a remodel at a later date when the practice grows to full capacity.